Wednesday March 22 1911 I worked all my spare time on my waist. Will cut down a small tree and made it into wood. burned brush and raked chips. I had a letter from Lizzie Lindley and wrote her a long letter in the evening. a nice day. 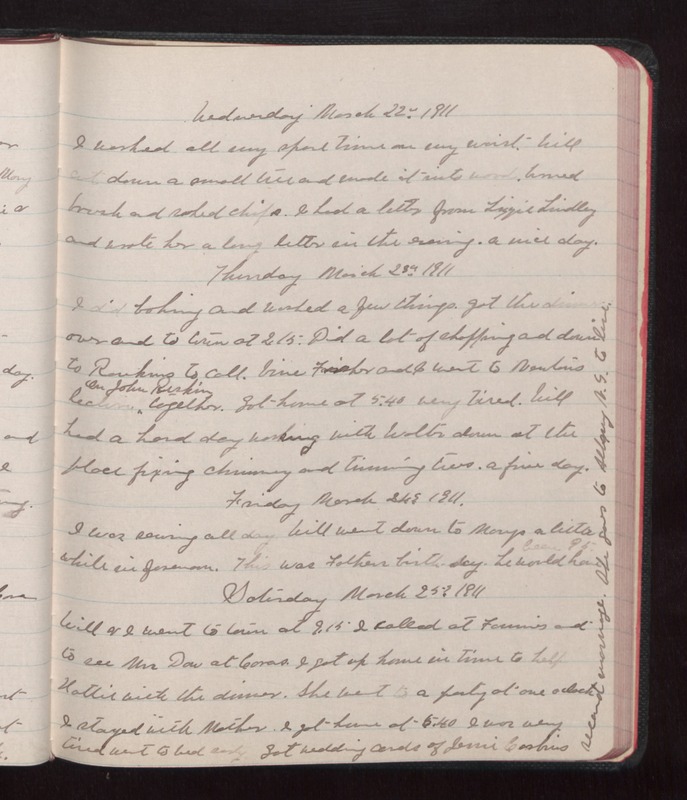 Thursday March 23 1911 I did baking and washed a few things. Got the dinner over and to town at 2.15. Did a lot of shopping and down to Rankins to call. [illegible] Fisher and I went to Newtons lecture on John Ruskin together. Got home at 5.40 very tired. Will had a hard day working with [Walter?] down at the place fixing chimney and [illegible] [illegible]. A fine day. Friday march 24 1911 I was sewing all day. Will went down to Marys a little while in forenoon. The was Fathers birth-day. He would have been 95. Saturday march 25 1911 Will & I went to town at 9.15 I called at Fannies and to see Mrs Dow at Coras. I got up home in time to help Hattie with the dinner. She went to a party at one oclock I stayed with Mother. I got home at 6.40 I was very tired went to bed early. Got wedding cards of Jessie [Corbins?] second marriage. She goes to [Albany?] N.S. to live.